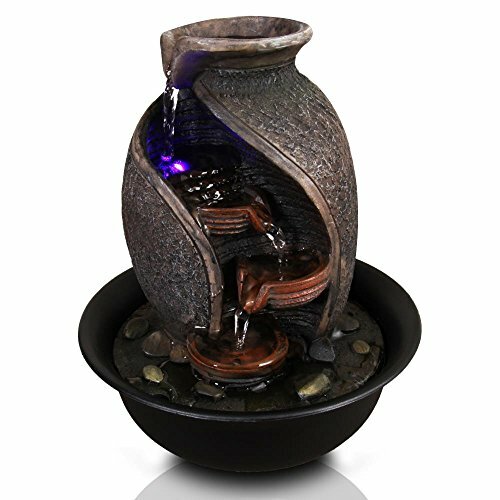 The SereneLife SLTWF70LED Meditation Water Fountain adds charm and relaxing sophistication to your home or garden. When it comes to letting the days’ stresses and anxieties fall behind, sometimes you need the gentle, relaxing sounds of water to help you ease a racing mind and tense body. Easy to set up inside or outside the home, this unique tabletop decoration has a built-in, automatic pump that circulates water continuously. That means you can fall asleep to the dulcet, relaxing tones of water flowing down each step. Better yet, it’s perfectly sized to fit all those decorative areas inside your home! LIGHTS UP THE MOOD: This 4-tier relaxing table top fountain decoration has a subtle LED illuminated lighting effect that is really pleasing to the eye and that's sure to improve your comfort.